Waterford Institute of Technology (WIT) BSc (Hons) in Agricultural Science student, Lorna Power has reached the final of the Enterprise Ireland Student Entrepreneur Awards. The finals take place in NUI Galway on Wednesday and Thursday 13 and 14 June where a total of 10 finalists from third level colleges all over the country will compete for €35,000 in cash prizes. The pair follow in the footsteps of previous entries from WIT who have made it into the final 10. Lorna Power who hails from Lismore, Co Waterford came up with the innovative business idea as part of the Rural Entrepreneurship Module on the BSc (Hons) in Agricultural Science degree at WIT. 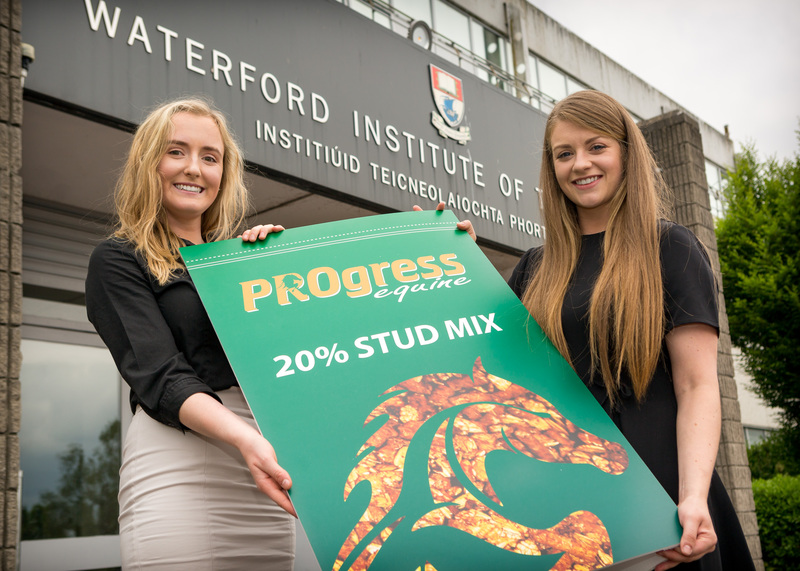 She then developed a business plan for a sustainably produced innovative equine feed with a higher than average protein concentrate over the course of the 12-week module. She collaborated on the idea with her friend Emma Murphy, a UCD Business and Law Student from Cashel, Co Tipperary and co-founder of PROgress Equine. Lorna was mentored by her lecturer, Rachel O’Dowd who encouraged the students to enter the competition. Having reached the final from over 1,500 entries nationwide, the two students have been supported and mentored over the past number of weeks by Rachel O’Dowd, lecturer in entrepreneurship at WIT; Ciarán Cullen, Manager, ArcLabs, WIT; James O’Sullivan, Technology Transfer Manager, WIT; and coordinated by Philomena Treacy from WIT’s Technology Transfer Office. In preparation the duo met with Dr Niall O’Reilly, Pharmaceutical and Molecular Biotechnology Research Centre (PMBRC) manager who explained how they could work together with an Enterprise Ireland innovation voucher to conduct analysis of the feed formulation. He also explained approaches to animal trial design and was able to put the team in touch with industry experts from the PMBRC’s wide network of contacts. Speaking about the competition Ciaran Cullen, Manager of Arclabs said: "Lorna Power and Emma Murphy are passionate entrepreneurs who intend to set up their company, PROgress Equine in Waterford and bring their innovative product to market over the coming months. We would like to wish the two girls every success in the competition and look forward to working with them in Arclabs over the coming months." Lecturer and mentor at WIT Rachel O’Dowd said that it is fantastic to see how a student project can transform from an idea generated in the lecture hall into a genuine business that has real market potential. Further down the line the students have the opportunity to apply for the Enterprise Ireland/WIT New Frontiers programme, based at WIT’s ArcLabs, a research and innovation hub on the institute’s West Campus.